This is my first attempt at writing up a pattern, so any hints and tips would be much appreciated. For those interested in what I made but not so fussed with how I did it, skip down to the photos! 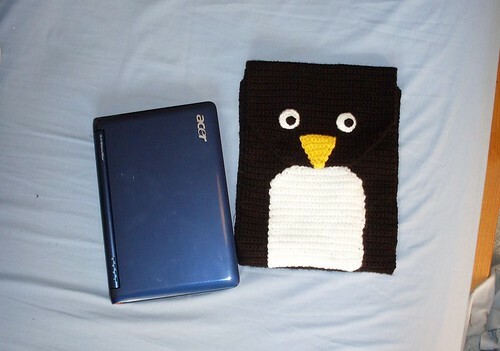 I was making a cosy for an Acer Aspire One netbook, which is 24cm x 17cm. Adjustments can easily be made for other sizes, I'm sure! 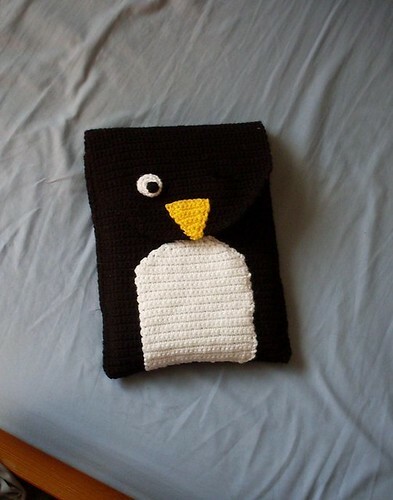 This is made all in one piece, starting at the top of the front, working up the back and ending at the tip of the beak. 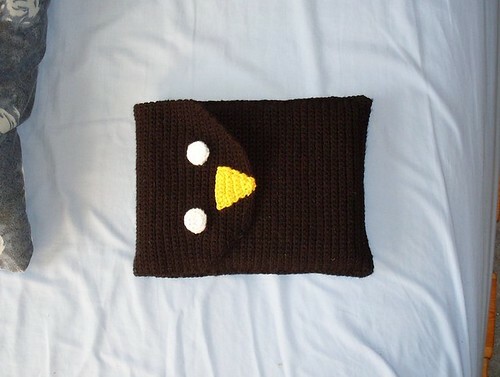 I tried to incorporate the beak into the body (as seen a couple of the photos below), but it didn't really work, so I ended up making a separate beak and stitching it on. I've written this up as just continuing in black, so ignore the yellow bit in the first photo! Repeat this row until it measures the same length of your netbook. 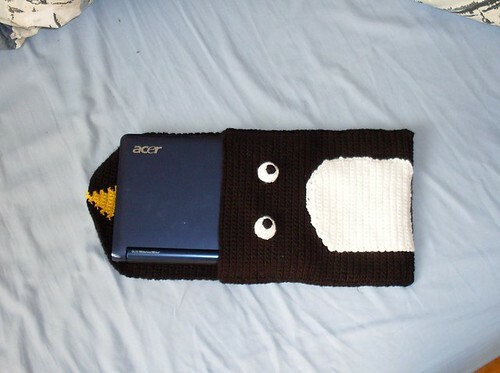 Took me 60 rows for an Acer Aspire One. Repeat this row until the back is about three inches longer than the front. I did 83 rows here. Repeat this row until 16 stitches left. Finish off. - Ch 1, DC 2tog. Finish off. These are worked in the round, around the buttons. - Insert button and sew closed. Fold the body at the obvious fold line, and sew up the sides. 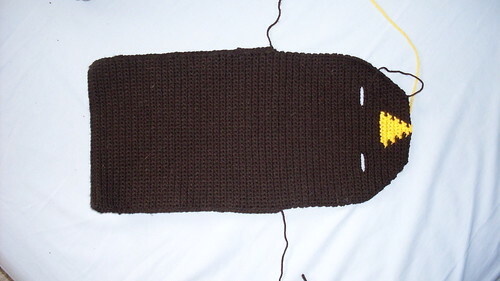 Sew the white front to the front of the body, and the beak to the outside of the top flap. 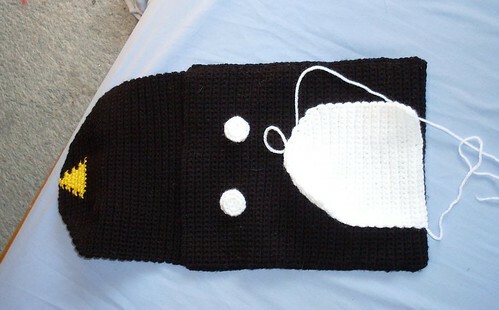 Position the eyes according to where the buttonholes are (I found it very useful to insert the netbook at this point!) and sew them to the front of the body. 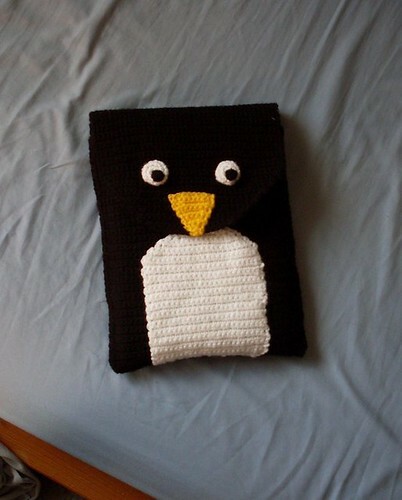 And, if you just button up one eye, it winks!